On my mission for winter beers, I mozy on down to Ramirez Liquor store. By far the best craft beer store in the east side of Los Angeles. As I was rummaging through the eclectic beer selection. This Stout Old No. 38 – Nort Coast Brewing, caught my attention, it is brewed near Fort Bragg, Northern California, where some of the most affluent beer breweries reside, and I knew that this was going to be a quality beer. 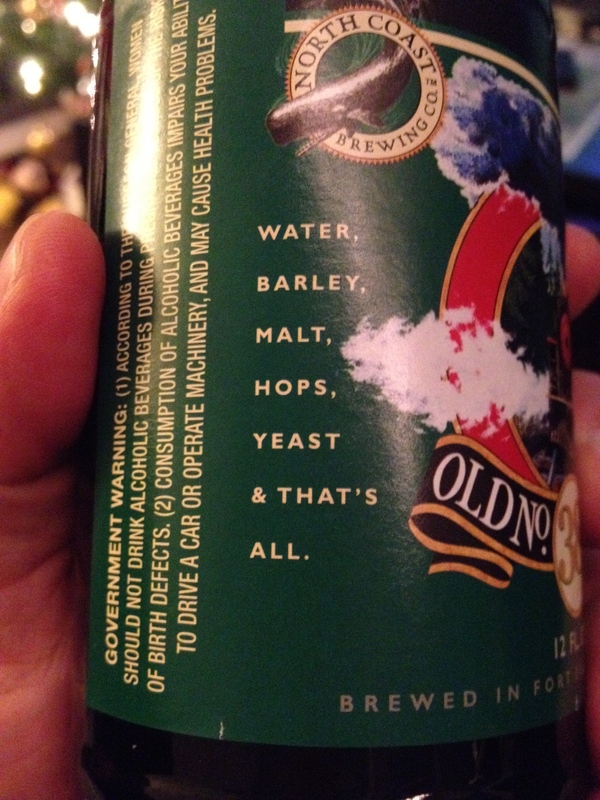 What sold me was its simplicity, as seen on my photo; Water, Barley, Malt, Hops, and Yeast and Thats All! So on my way home, to taste this touted Stout. I cleared my kitchen counter top, searched for my bottle opener, but before I opened the beer. I rinsed my pallet, because I ate a double Western Cheese burger for lunch, and I wanted no burger residue to obstruct my tasting buds. Finally, tasting time (drum roll please) popped opened the bottle, a faint Swishhhh emerged, awww I just heard the sound of a true Stout, because of their low carbonation. My mouth was salivating at this time. Down the hatch, first impression SMOOTH! then the spices kicked in, roast coffee taste, not too hoppy, minimal bitterness, oh did I mentioned SMOOTH!! – This was a dangerous beer for me because, I can drink this beer all night long!!!. I was so excited and told my drinking partners and immediately did research online! And this is what I found. 1. North Coast Brewing Co – was certified as one of the ten best breweries in the world! 3. Beer Advocate – rates this beer very high and consumer have nothing but good comments. This beer will be in my winter rotation for sure! Christmas came early for me and what a surprise it was! Oh, I polished of the sixer that same night, watching my UCLA Bruins destroy USC! What a way to end my day! Tell next time, cheers! ~ by Golden Foam Notes on December 1, 2013.